We currently have three male puppies left to reserve from our March litter of puppies from Dolly and Cooper.Reserve your puppy now! Here at Rosewood Goldens we believe that happy dogs equal happy clients. All of our dogs are part of our family and have a healthy and happy life here. We own 26 acres in western Wisconsin and our dogs spend time in the house and also get a lot of playtime with each other outside. 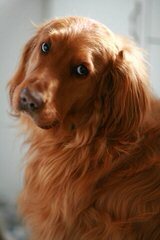 We don’t believe in kennel dogs, especially with a breed like the Golden that loves to be with their people. All of our puppies are born in the house and stay there until they are starting to run around and play, then they go into our spacious outdoor kennels equipped with houses with heated floors in winter. Our mommas get breaks from their puppies and come into the house and get much needed couch time. This keeps them happier and healthier. We have several litters available per year and we have colors from light golden to red available. All of our puppies come microchipped, vaccinated, wormed, they are vet checked before they go home, and come with AKC registration papers, a health guarantee against genetic disorders and their vaccination records. We are always here to answer questions and to talk about our dogs.